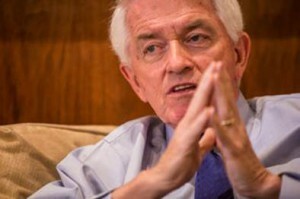 Thomas J. Donohue, the head of the U.S. Chamber of Commerce, has defended the tobacco industry’s right to sue under future international treaties. The chamber, a private nonprofit that has more than three million members and annual revenue of US$165 million, spends more on lobbying than any other interest group in America. For decades, it has taken positions aimed at bolstering its members’ fortunes. For foreign companies, membership comes with “access to the U.S. Embassy” according to the Cambodian branch, and entree to “the U.S. government,” according to the Azerbaijan branch. Members in Hanoi get an invitation to an annual trip to “lobby Congress and the administration” in Washington. 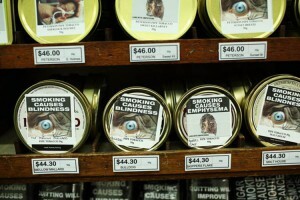 Plain packaged tobacco products with health warnings in Sydney, Australia. 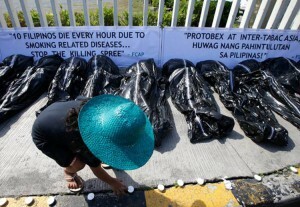 Protesters displayed fake body bags at a tobacco trade show at Pasay, the Philippines, in 2013. Sofiia Kochmar contributed reporting from Kiev, Bhadra Sharma from Kathmandu and Palko Karasz from London. 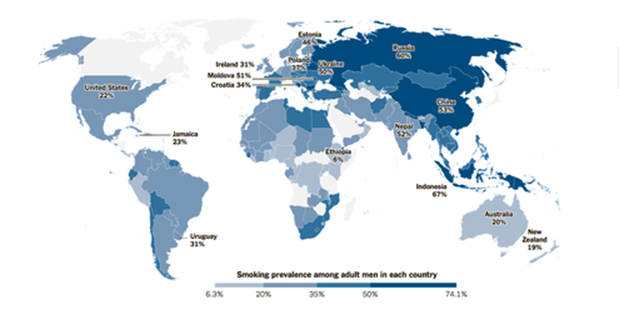 Posted in: Government, Health Warning, Plain Packaging, Tobacco Control, Tobacco Lobby, WHO.